Google Philippines has launched online services that can be used as sources of information as the nation prepares for the possible devastation of typhoon ’Ruby’ in the coming days. <>As the country prepares for possible devastation of typhoon ’Ruby’ (international code name ’Hagupit’), Google has again activated several online resources to help keep the public posted about updates and information related to the pending calamity. Public Alerts provides real-time updated information from PAG-ASA (Philippine Atmospheric, Geophysical and Astronomical Services Administration). It also posts other related and important information about the typhoon particularly its expected route and anticipated effects. Within the same Web page can be found the Google Crisis Map. 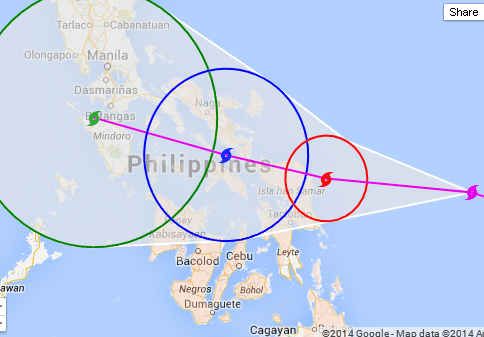 The map contains data on shelters, evacuation centers, and the predicted and actual track of the typhoon. The Crisis Landing Page contains Google’s Person Finder service and emergency contact numbers. It can be recalled that the giant search engine also launched its Person Finder service in November 2013, immediately after the devastation of typhoon ’Yolanda’ (international code name ’Haiyan’) in the Visayas region. The service was first rolled out in 2010 during the big earthquake that hit Haiti. Person Finder can be a resource where people can look for their friends or relatives in the affected areas after the disaster. At the same time, it can gather information from online users who have information about people who are in the affected locations, so that their friends and relatives in other areas can be notified about their whereabouts and condition.